The B-35 was the brainchild of Jack Northrop, who made the Flying Wing the focus of his work during the 1930s. 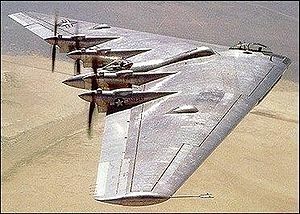 During World War II, Northrop had been commissioned to develop a large wing-only, long range bomber designated XB-35. Northrop advocated the "flying wing" as a means of reducing parasitic drag and eliminating structural weight not directly responsible for producing lift. In theory, the B-35 could carry a greater payload faster, farther, and cheaper than a conventional bomber. On 11 April 1941, the United States Army Air Corps sent out a request for a bomber that could carry 10,000lb (4,536kg) of bombs to a round-trip mission of 10,000mi (16,093km). Requested performance was a maximum speed of 450mph (740km/h), cruise speed of 275mph (443km/h), and service ceiling of 45,000ft (13,716m). This aircraft would be able to bomb Nazi-occupied Europe in the event that Britain fell, similar to what the Nazi Germany's RLM's own Amerika Bomber program was intended to do. This proposal was originally submitted to Boeing and Consolidated Aircraft Company, and led to the production of the Convair B-36. In May, the contract was also extended to include Northrop, inviting them to submit a design along the lines they were already exploring. Since the new aircraft would require a significant amount of engineering work in untested waters, the first order placed was actually for a one-third scale version of the XB-35 dubbed the Northrop N-9M (M standing for model). This aircraft would be used to gather flight data on the Flying Wing design, which would then be used in designing the big XB-35. It would also be used to familiarize pilots with the radical, all-wing concept. Early in 1942, design work on the XB-35 itself began in earnest. Unlike conventional aircraft, Flying Wings cannot use a rudder for lateral control, so a set of butterfly-like, double split flaps on the trailing edge of the wingtips were used. When aileron control was input, they were deflected up or down as a single unit, just like an aileron. When rudder input was made, the two surfaces on one side opened, top and bottom, creating drag, and yawing the aircraft. By applying input to both rudder pedals, both sets of surfaces were deployed creating drag so that the airspeed or the glide angle could be manipulated. On 22 November 1941, the Army Air Corps signed the development contract for an XB-35; the contract included an option for a second aircraft, which was exercised on 2 January 1942. The first was to be delivered in November 1943, the second in April of the next year. Detailed engineering began in early 1942. A fuselage-like crew cabin was to be embedded inside the wing; it included a tail cone protruding from the trailing edge. This tail cone would contain the remote sighting stations for the gunners in the production model. In the rear of the cabin, there were folding bunks for off-duty crew on long missions. The aircraft's bombload was to be carried in six small bomb bays, three in each wing. This design precluded the carrying of large bombs, including early atomic bombs. Production aircraft would have defensive armament of 20 .5 in (12.7mm) machine guns or 20mm cannon, carried in seven turrets, three on the aircraft's centreline and four above and below the outer wings. The B-35 would take advantage of a new aluminium alloy devised by Alcoa; it was considerably stronger than any alloy used previously. In June 1946, the XB-35 made her first flight, a 45-minute trip from Hawthorne, California to Muroc Dry Lake. The XB-35s were soon grounded after only a handful of flights. When they flew again, problems continued to plague them. Nevertheless, the flight test program proceeded until the whole project was cancelled. The first and second XB-35s were scrapped on 23 and 19 August 1949, respectively. On 30 September 1943, 13 pre-production YB-35s were ordered by the Army Air Force. By the time the first one had flown on 15 May 1948, it was clearly made obsolete by the advent of the jet engine. Only the first YB-35 was ever flown. Testing lasted only a few months. The YB-35 was scrapped 20 July 1949. The unfinished YB-35 #2, was scrapped 19 August 1949. The other 11 of 13 YB-35 aircraft ordered underwent conversion to other powerplants. Two were converted to use eight Allison J35 jet engines, and designated YB-49. Both aircraft were destroyed in accidents. Seven incomplete airframes began conversion to jet power as YB-35B but were never finished. One was converted to use six jet engines, and was used as an experimental reconnaissance aircraft designated YRB-49A. In order to test the Turbodyne T-37 turboprop engine, produced by a subsidiary of Northrop, the final YB-35A was planned to be converted to EB-35B standard (in this case the suffix E- on the designation meant exempt, not the later Electronic). The testbed would be capable of carrying two T-37 engines, although it was at first planned to only test a single engine. The B2T was a United States Navy designation for one B-35 for trials, project cancelled. The Army Air Force had originally ordered 200 production model B-35s. Since Northrop's facilities were not up to the task of producing them, the Glenn L. Martin Company agreed to undertake mass production. This proved irrelevant when the aircraft had too many development problems. Even disregarding these, so many of Martin's engineers had been drafted by 1944 that Martin pushed the first delivery date back to 1947. Seeing that it would almost certainly never be ready in time for the war, the Army Air Force canceled the production contract, though the Air Technical Services Command continued to run the program for research purposes. Actual flight tests of the aircraft revealed several problems: The contra-rotating props caused constant heavy drive-shaft vibration and the government-supplied gearboxes had frequent malfunctions and reduced the effectiveness of propeller control. After only 19 flights, Northrop grounded the first XB-35; the second aircraft was grounded after eight test flights. During this time, the contra-rotating propellers were removed and replaced with four-blade single-rotation propellers. In addition to having continued drive shaft vibration problems, the new single-rotation props greatly reduced the aircraft's speed and performance. Furthermore, the intricate exhaust system turned into a fiasco to maintain. After only two years of use, the engines already showed signs of metal fatigue. In the end, the program was terminated due to its technical difficulties, the obsolescence of its reciprocating propeller engines, and the program being far behind schedule and over budget. Another contributing factor to the program's failure was the tendency of Northrop to become engaged in many experimental programs, which spread its small engineering staff far too wide. While the competing propeller-driven B-36 was obsolete by that time and had just as many or even more development problems, the Air Force needed a very long range, post-war Atomic bomber to counter the perceived Soviet threat. It had more faith that the B-36's "teething" problems could be overcome, compared to those of the new and radical "Flying Wing", the unofficial name that was later associated with all the Northrop "all-wing" designs. There are long-standing conspiracy theories about the cancellation of the Flying Wing program; specifically, an accusation from Jack Northrop that Secretary of the Air Force Stuart Symington attempted to coerce him to merge his company with the Atlas Corporation-controlled Convair. In a 1979 taped interview, Jack Northrop claimed the Flying Wing contract was cancelled because he would not agree to a merger because Convair's merger demands were "grossly unfair to Northrop." When Northrop refused, Symington supposedly arranged to cancel the B-35 and B-49 program. It should be noted that Symington became president of Convair after he left government service a short time later. Other observers note that the B-35 and B-49 designs had well documented performance and design issues while the Convair B-36 needed more development money. At that time, it appeared the B-36 program might be cancelled as well as the B-35. The USAF and the Texas Congressional delegation desired to have a production program for the large Fort Worth aircraft production factory, and Convair had much more effective lobbyists in Washington DC. The Northrop Corporation was always a technological trailblazer but the independent nature of Jack Northrop often collided with the political wheeling-and-dealing in Washington that tended to run huge military allocations. Consequently, the B-36 prevailed. Furthermore, earlier the same year, when the YB-49 jet bomber was cancelled, Northrop received a smaller production contract for its F-89 Scorpion fighter as compensation for the lost Flying Wing contract. Allen, Francis. "Before the B-2: Northrop's Flying Wings, The XB-35 and XB-49". Air Enthusiast. No. 106, July/August 2003, pp.2-12. Stamford, UK: Key Publishing. ISSN 0143-5450. Fitzsimons, Bernard, ed. "Scorpion, Northrop F-89." Illustrated Encyclopedia of 20th Century Weapons and Warfare, Volume 21. London: Phoebus, 1978. ISBN 0-83936-175-0. Gunston, Bill. "Northrop's Flying Wings". Wings of Fame. Volume 2. London: Aerospace Publishing, 1996. ISBN 1-874023-69-7. ISSN 1361-2034. pp.24-37. Winchester, Jim, "Northrop XB-35/YB-49". Concept Aircraft: Prototypes, X-Planes and Experimental Aircraft. Kent, UK: Grange Books plc., 2005. ISBN 1-84013-309-2. "The Wing". Flight, 20 March 1947, pp. a-b, 241.